← Market Timing Brief for the SP500 Index Close on 12-06-2013: More Upside? 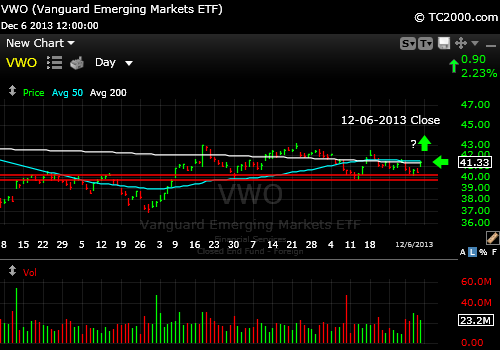 Market Timing Brief for the Emerging Market ETF (VWO) Close on 12-06-2013: The Best Choice for 2014? The Emerging Markets have at least for now made a bottom and are moving up. Decent valuation with a higher dividend yield are there too if you compare VWO vs. the SP500 Index. I’m fully invested in the emerging markets now, actually with a 25% overexposure vs. my usual maximum exposure. On the chart below, you can see that VWO did NOT make it through resistance the last two times it has tried, and even formed a lower high in the prior move, but I believe the 3rd time may work, because there have been two higher lows since the last major low shown. It paused at the 50 day moving average on Friday, so it could turn down from that resistance on negative news. The risks? If growth slows more than was thought or if interest rates rise too fast, emerging markets may underperform the US markets. But if the US employment rate is improving (to 7% this past month from 7.3%), it means more people shopping for emerging market goods in the United States, which means E’s will rise for emerging markets into 2014. Despite the risks, my money is where my mouth is. You can decide for yourself. Emerging markets represent value bouncing from the prior low. For some other useful information…I covered my thoughts on investor sentiment for free subscribers, which you can access after getting the password here: Free Subscription to My Newsletter and access to my latest comments I’ll send you back the password to the access page and the monthly newsletter in the same email. I thank Worden Brothers for the chart system I use to post these charts. If you want to know more about the charting system I use every day, go to my “Other Resources” page here: Other Resources It makes it much easier to follow along with me if you can see the charts and manipulate them on your own computer, so it’s a great investment to have an excellent charting system. Look for updates on the main chart tracking pages this week as I feel they are needed and comments via Twitter. This entry was posted in investment, large cap stocks and tagged emerging market ETF, market timing, vwo. Bookmark the permalink.